Weymouth & Portland Harbour have the best wind stats on the South Coast of England, and are understandably recognised as the top-notch kiteboarding spots. If it is Olympic-level kiteboarding you’re after then give Weymouth a go. Portland Harbour has exposure to the best wind stats on the South Coast of UK, and understandably recognised as one of the tip top best European spots for kiteboarding, windsurfing, and SUP – it’s sort of wedged in this protected bubble, making it practically accessible at all tides, all the time, all year around! All the wind, and little wave to throw you, so you can feel the need, the need for speed! Developed for the London 2012 Olympics, the Jurassic Coast and the only natural World Heritage Sites background your quintessentially English experience onboard your board! Then just around the corner is the three-mile playground of Weymouth Beach which opens you up to the elements ... a completely different experience of kitesurfing will be unleashed here, and boy, you better be ready! Budding enthusiasts only … no beginners allowed! Clean winds, sheltered waters and weak tides give you the perfect pieces for an awesome day on the water. OK, if I’m being brutally honest, sunshine and warmer climates would be welcomed, but there is something to be said for the typical all-season English weather - so grab a decent wetsuit and toughen up!! Portland Harbour is quite a unique spot. Not only is it the home to the 2012 Olympic watersport spots, but it’s fairly consistent in most winds. Westerly’s in this region would shoot any kiter off course, but here it is mostly flat calm. Thanks to the 20-metre-high Chesil Beach just across the causeway, you could get all the wind you could (or couldn’t) handle but virtually no seas at all. Chesil Beach is an 18 mile long shingle bank that was formed donkey’s years ago (around 7,000 actually) linking Portland to the mainland at Wyke Regis. Between Wyke and the shingle bank is a salt water lagoon called the Fleet, which stretches some 10 miles west and makes for a good spot to play around in too! So, as you have heard, 2012 Weymouth & Portland hosted the Olympic sailing events due to its awesome location, protection and investment. International sailors and journalists alike said it was the best sailing venue in Olympic history … seriously. England. The best? Come on now…. And that’s saying something! The UK National Sailing Academy had a major revamp including a 150 metre wide launching ramp for dinghies and the whole area is set up for a calm ride. So now you see sailors and kiters side by side in world-class windy watersports competitions now ... who would have thought! Just north east of here is Weymouth Bay - a difference kettle of fish. Bump n jump is the theme here, with the English Channel coming in hard and fast, from Weymouth Bandstand, up to Overcombe, and beyond to Ringstead, this whole stretch is open to the elements. Its Dorset southeast facing location offers the best waves at low to mid-tide, making your ride a bit more fun all year around. Kiteboarding season, when to rock up? It's tricky to exactly pinpoint the kiteboarding season in the UK. You can ride all year round, it just really depends on how willing and comfortable you are riding in colder conditions. Generally, the more preferable months are spring and summer when the water start warming up, but even then a warm wet suit is probably a good idea. As with most of the UK, summer falls between June and September, but beaches can be busy with sunseekers during these holiday months. Water temperatures remain cool, peaking at a max of 15 degrees after its had the whole summer to warm up (mid September), but weather can be unpredictable at all times of the year so … prepare for everything! Aside from these months where some days see literally no wind, you may prefer to explore the areas in spring and fall. Quieter beaches, stronger winds and manageable temperatures mean that it is a kitesurfer's paradise for all … well, most. Weymouth Beach is one of the top kiteboarding spots, but can get very busy in the summer, so Portland Harbour takes the biscuit during the warmer months. Portland Harbour is fairly windy yet sheltered in all winds, so you can ramp it up safely most of the year. Around here though, easterly winds are the dream. Shallow waters, good conditions, and safe for all abilities, you’re protected from mother nature and can enjoy the space. The offshore westerly can be a little trickier with some bump n jump to fly about on, so if this isn’t your thing then perhaps jump on a dinghy 2 hours either side of low tide! Oh my days, where to start. So before you even think about where and when and how, you need to know the rules of the road. PERMITS ARE REQUIRED! In order to kitesurf this region, you need to become a club member or at least acquire a day, week or year permit, depending on how long you want to stick around for. Permits can be picked up from the Portland Harbour directly. The port is privately owned, so the fees not only cover the harbour dues, but it also acts as proof for 3rd party insurance (at minimum) so you can all ride together, like one big happy waterbaby family!! In essence, no permit, no play! And this permit will cover you for Portland Harbour, and all the Weymouth Bay beaches. Check out the Portland Harbour website here for more info on the permits and where to buy them. So, now we have the legal stuff out of the way, let's get down to where to rig up! Portland Harbour - there is a Pay & Display car park for Chesil Beach, just a quarter mile up the causeway from Wyke Regis that costs around £4.50 for four hours. You cross the very busy and fast road and then some rough ground to get to your launch point. There is a stretch of around a mile of water between Wyke Regis and the National Sailing Academy. As pointed out earlier there is virtually no fetch for the waves so even in extreme conditions you will find millpond-calm waters for the first hundred metres out. Even at high tide it is relatively shallow - no more than neck deep for a good 200 metres out. Safety first, indeed! You’ll be sharing the area with windsurfers, fellow kiteboarders and other sailors alike, so keep your eyes open. Your launch will be at Ferrybridge (off the causeway), so you can stay out of the way! Attracting the kiss-me-quick and sandcastle brigade, in other words, be careful of small children on the beach! The best place to park is at Town Quay, though it makes sense to stop by the beach, dump your gear and a buddy to stand over it and then park up the road. Toward the Town Quay end the beach is sand and is shallow to a good 200 metres out. Toward the Pier it is shingle and shelves very quickly. Southerly winds aren’t protected by Portland so well - particularly towards the east end of the three mile long beach - and you can have up to 1.5 metres of waves in a good southerly blast. And yes - you can do reaches of up to three miles each without running out of beach if you want! Still in the “permit” region, and as we head further north east from Portland Harbour, Weymouth Bandstand makes a popular spot in winter months. Only open to kiters between 1st October and 31st April, you’ll find a mix or sand and shingle here. Careful of the offshore winds here, and (needless to say) the obstruction of the pier … don’t want to be flying into that!! Further north again, freestylers flock here for bump n jump conditions. Argueably one of the best launch sites along the Weymouth Beach, I would again aim to hit it out of season (October to April) to avoid crowds. The shorebreak here is an ideal learning spot, and although cold, its cross-shores make for some fun wizzzing noises up and down the bay. Sharing this area with windsurfers, high speed collisions are your biggest threat here, so just keep your eyes open and don’t get cocky. Almost at the end of Weymouth Bay is a summer seekers shingle beach, often used for launching jet skis due to the steep shelf just 5 metres out. There is free parking, just a short walk to the beach (woop), although it may make sense to pay to park at the beach (roughly £1 an hour) for ease of lugging your gear around. This is a great beach for east of south winds, and is a lot less busy in most conditions than the Weymouth end of the beach due to the shingle - kids can’t build sandcastles out of pebbles, and sunbathing can be like a bed of nails! As indicated earlier, you can choose to reach across to Weymouth Harbour entrance if you want on a lay line of a good couple of miles. Bridging out further north out of the bay, Ringstead is a beach for experienced and confident kitesurfers. A challenging spot, the compilation of narrow beach, reef and shingle means that the wave can be interesting at times – a bloody excitement for some! Still within the permit region, your launch is at the bottom of the grass bank (not the top) or at the narrow beach, and if you love a good storm, then this is the UK (or European) place to be!) A few things to watch out for here… which are fairly obvious… like the reef, the narrow beach and the producing wave. Well, with an Olympic site at your fingertips, it goes without saying that ALL the winter sports are available, including kayaking, sailing, SUP’ing and other things, that don’t require wind. If you’re after more land-based funsies, then you have the entire Jurassic Coastline to explore. Spreading from Exmouth to (almost) Bournemouth, there are endless inlets, coves and beaches to explore, walk, photograph, coasteer and nestle within. Some of the top picks are Lulworth Cove, Beer, Durdle Door, Golden Cap and Old Harry Rocks. I used to sail into Weymouth Harbour a lot, and this cute seaside town is worth a bumble. Grab an ice cream, wander through the quaint streets and watch the fisherman work in this unique and picturesque town. And then to bring out the inner kid in you, check out Weymouth’s Sandcastle Sculpture Park. Everything from your fave animals, movie characters and book characters feel real as thousands ooooh and aahhh at sandistic talents! 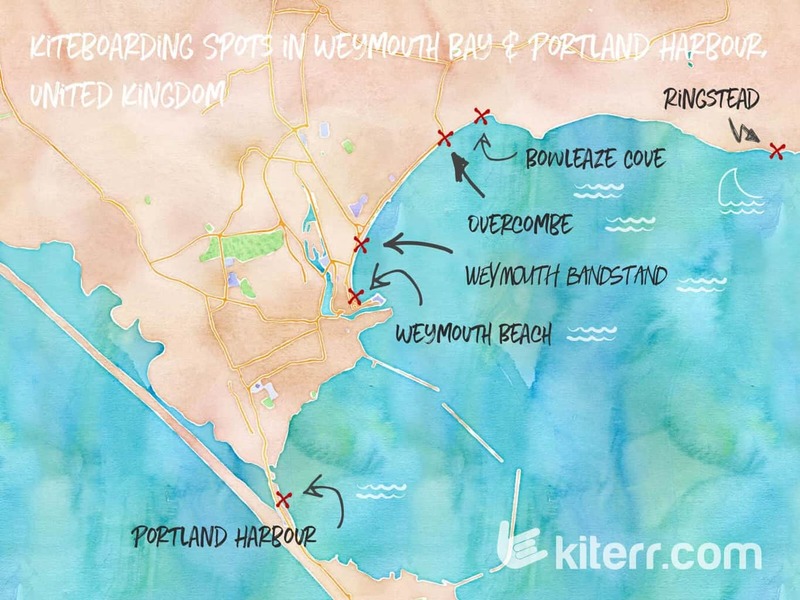 If you know of any other spots for kiteboarding in Weymouth area, share your secrets in the comments! Stay tuned for the guide on kiteboarding in Westward Ho! and checkout some other cracking European kitespots, like Algarve in Portugal.